The text-shadow, box-shadow and border-radius properties are essential elements of CSS3 for producing the next generation navigation menus, complete with various objects that make them both functional and stylish. Using a rectangular box as an example, drop shadow, outside shadow, inner shadow, CSS3 can pull off all of them and more. While results like creating an inner shadow have been achieved in the past, using external images and other design tricks to bypass the limitations of previous versions of CSS and HTML, CSS3 relieves you from so many pointless tasks that people who tried it at least once wonder at themselves how they could ever manage to build websites without it. Indeed, object parameters and features offered by CSS3 are very intuitive and the results of their involvement look so professional that they are worth exploring even if all you are looking for are fresh designs for your website’s navigation menu. Perhaps the only thing you should do in that case is find a free and nifty application like CSS3 Menu, which will allow you to make all the necessary adjustments to your navigation bar from the comfort of an intuitive and functional user interface. The advantages of joining in on the craze and creating your own CSS3 buttons are enormous. There are so many reasons out there that every website creator can choose one of their own. Accessibility, ease of use, quality, complete control over the end result and a style that mimics professional design to the tee. The compatibility problems of CSS3 are starting to fade into obscurity. Opera developers have included nearly all the properties into their latest version, from CSS3 inner shadow to paper curls, with browsers like Chrome, Firefox and Safari already supporting most of these features for over a year. Internet Explorer, as always, has fallen behind on opening up to the wonders of CSS3, but it appears that the third quarter of 2012 promises a near universal CSS3-compatibility across all browsers and platforms. There is also an additional incentive for site owners and web designers alike to jump on the bandwagon of CSS3-coding and enjoy inner shadows today, instead of tomorrow. Through careful testing, it has been concluded that not only the majority of modern browsers support CSS3 without any significant errors, the browsers that are not compatible are able to interpret the code with only minor setbacks by disabling the advanced graphical features. It might make the navigation menu look bad, but at least it will retain the necessary functionality and will not throw user experience out of the window. Some webmasters might decide to tune down on their use of CSS3 as a way of catering to the Internet Explorer 9 users and by doing so target the whole population of the Internet without any botched graphics. This is certainly a viable course of action, but causes them to miss out many great opportunities, which will be commonplace as soon as Internet Explorer 10 arrives on the scene and resolves all issues with CSS3 incompatibility. Hello CSS3 Menu team, How are you? Hope you are doing well. While I was trying to download and install the software I got an error message has something to do with software developer identification. Hi, I am experimenting with your software, and don't see any way to show a certain menu selection is active on a page. What I want, is when I click on a menu button, I want to highlight that the button is selected. We still require your assistance to make this work. The drop down is working with Google chrome and not with IE. I am sending you the different screens for you to look at. I understand there are additional code to enter. I built a menu for a new website... The menu works perfectly in Chrome and Firefox but in IE there is no rounded corners and the sizing looks wrong. When I view the site locally (not on the server), it displays correctly in IE. 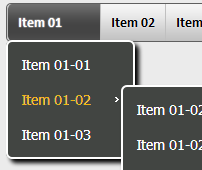 Does your menu creation program support both horizontal and vertical menus - using the same menu style?